Rookie Shaquem Griffin could get the start at weakside linebacker in 13 days in the opener at Denver if Wright is not back. Seahawks veteran linebacker K.J. Wright is having his knee scoped Monday to fix and determine the extent of a problem that arose after the game Friday at Minnesota, coach Pete Carroll said. It is unclear if he will be ready for the regular season opener at Denver on Sept. 9. Wright was on the field for 45 snaps against the Vikings — tied for the third-most of any Seattle defensive player — and spoke to reporters afterward indicating no hint of an injury. Carroll said Wright was not hurt in the game, but “just felt something wasn’t quite right” afterward. “Took a good look at him, so we are going to do a scope job and get him back really quick,” Carroll said. Carroll, though, said “I don’t know” when asked how long Wright would be out and also said “don’t know” when asked if Wright will be ready for the season opener. Rookie Shaquem Griffin is Wright’s backup and worked with the starting defense at weakside linebacker Monday. If Wright is out, the Seahawks could begin the 2018 season opener with just one defensive player who was part of the Super Bowl teams — middle linebacker Bobby Wagner. Earl Thomas remains a hold-out, the status of Byron Maxwell is unclear, and every other player from those teams already has left. Griffin, a fifth-round draft choice in 2018, has been Wright’s primary backup throughout training camp. Seattle also lists rookie free agent Jason Hall as a backup at weakside linebacker. But should Wright be out for any period of time, the Seahawks could — and almost certainly would — explore other options such as veteran D.J. Alexander, who filled in for Wright last season against Jacksonville when Wright suffered a concussion. Austin Calitro, who has worked as Wagner’s backup throughout camp and was praised by Carroll on Monday, also could potentially help fill the WLB spot, if needed. Wright, 29 and entering the final year of his contract, has been the team’s primary weakside linebacker since the 2013 season and has started 103 games since being drafted in 2011. Wright also dealt with a knee issue last season and had a Regenokine “blood-spinning’‘ treatment during training camp. Carroll said he didn’t know if the scope is on the same knee. 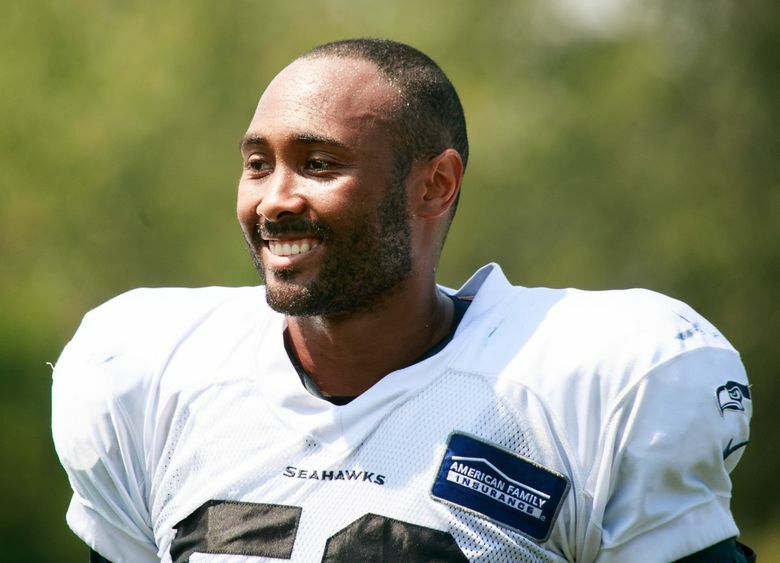 But while the news on Wright was somewhat ominous, news about receiver Doug Baldwin was much more positive. Monday, Baldwin was back in a helmet and doing individual drills for the first time since he was shut down after the first two days of training camp. Baldwin took part in the first two practices, but then was shut down to rest a sore knee, with the thought that he would be more ready for the season by treating it then instead of going through the rigors of camp. That plan appears to have worked. — Free safety Tedric Thompson suffered a rib injury and a stinger in the game against the Vikings and, per Carroll, is “day-to-day” as the team assesses his situation. With Thompson out, Bradley McDougald and Delano Hill were the primary starting safety tandem in practice Monday, but Maurice Alexander and Mike Tyson also remain in the mix. McDougald has been playing primarily strong safety earlier in camp with Thompson at free as the starting safety duo. But he was back at free safety primarily on Monday with Delano Hill at strong. — Defensive end Frank Clark suffered a hyperextended elbow injury in the game — Carroll said specifically after the game Friday that Clark was not on the injury report — and was held out of practice Monday. Carroll did not give a further timeline. — Cornerback Byron Maxwell remains out with a hamstring issue and Carroll said it is unclear when he will return. — Running back Rashaad Penny has a chance to play Thursday after missing the past two games with a dislocated finger, but Carroll wouldn’t commit that he will play. — Defensive end Dion Jordan “is making progress” and “making a bid” for getting back in time for the regular-season opener, but Carroll said it remains unclear if he will. Jordan is on the PUP (Physically Unable to Perform) list with a stress reaction in his leg. The team could leave him on the PUP list and open up a roster spot but then he would have to miss at least the first six games. “That’s the decision we have to make,” Carroll said. — Offensive lineman Rees Odhiambo was sick and missed practice Monday. D.J. Fluker also sat out, apparently to rest his knee. That had Jordan Roos running as the starting right guard with J.R. Sweezy also remaining limited and now working on the left side. The rest of the offensive line remained the same as it has been throughout camp. Seahawks coach Pete Carroll reviews Friday’s game against the Vikings.